AMMONNEWS - England finally ended their penalties curse when they beat Colombia 4-3 in a shootout after drawing their World Cup last-16 clash 1-1 following extra time after the South Americans equalized in the 93rd minute. England had previously lost all three World Cup shootouts and three of four in the European Championship but prevailed on Tuesday when Mateus Uribe and Carlos Bacca failed to convert, leaving Eric Dier to win the game for England. Earlier Harry Kane smashed in a 57th-minute penalty, his sixth goal of the tournament, and England looked to be through until Yerry Mina headed an equalizer in the third minute of stoppage time. 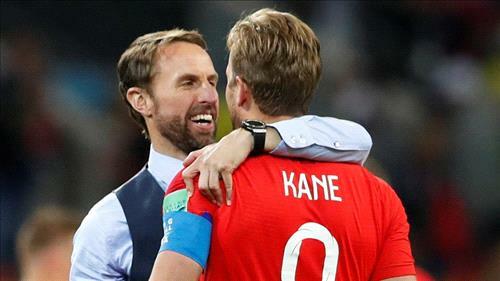 Then comes a potential semi-final against hosts Russia or Croatia with Tuesday’s win appearing to vindicate - just - coach Gareth Southgate’s decision to field a second-string side in the final group game loss to Belgium to secure an easier route. Colombia’s hopes suffered a huge setback before kickoff when key playmaker James Rodriguez was ruled out with a calf injury and without him they took a defensive approach and never rarely threatened. England were always the more purposeful side but they lacked the key final ball and needed a gift to take the lead. The South Americans had been getting away with blatant holding and wrestling at each of England’s many corners and the referee’s patience finally snapped when Carlos Sanchez hauled down tournament leading scorer Kane once too often. After four minutes of mayhem as the Colombians protested, Kane kept his cool and smashed in his third spot kick of Russia 2018. England keeper Jordan Pickford made a superb save to touch wide a furious long shot by Uribe but from the following corner - Colombia’s first of the match - giant defender Mina rose highest to head in the equaliser and send the massed Colombian fans into a frenzy.